WOOLSEY, Lynn C., a Representative from California; born in Seattle, King County, Wash., November 3, 1937; graduated from Lincoln High School, Seattle, Wash.; attended the University of Washington, Seattle, Wash., 1955-1957; B.S., University of San Francisco, San Francisco, Calif., 1980; human resources manager and personnel service owner; teacher, Marin Community College, Indian Valley, Calif.; instructor, Dominican College of San Rafael, Calif.; member, Petaluma, Calif., city council, 1984-1992; vice mayor, Petaluma, Calif., 1989 and 1992; elected as a Democrat to the One Hundred Third and to the nine succeeding Congresses (January 3, 1993-January 3, 2013); was not a candidate for reelection to the One Hundred Thirteenth Congress in 2012. 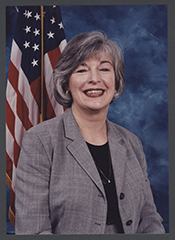 Lynn C. Woolsey in Women in Congress, 1917-2006. Prepared under the direction of the Committee on House Administration by the Office of History & Preservation, U.S. House of Representatives. Washington: Government Printing Office, 2006.